A big day for Google as it announced a new tablet, a new Smartphone and upgraded version of it’s old tablet Nexus 7. Google has launched a high end tablet Google Nexus 10 in partnership with Samsung Google Nexus 10, Smartphone in partnership with LG, Google Nexus 4 and has upgraded his most sold tablet Google Nexus 7. All the three devices will run on Android 4.2 Jelly Bean. Google Nexus 10 is a new 10 inches Android tablet announced by Google yesterday (29th October 2012). The configuration and specifications of this new tablet by Google are amazing. The tablet is said to have the world’s highest resolution display. Google Nexus 10 has screen size of 10.1 inches with a display of 2560*1600 (300 pixels) which is higher than the recently launched fourth generation iPad. Nexus 10 is made in partnership with Samsung. Google Nexus 10 has dual core processor of 1.7GHz and RAM of 2 GB. Important feature it runs on Android 4.2 Jelly Bean as its operating system. The camera both front and rear are superb, 5 mega pixels with LED flash rear camera and 1.9 mega pixels front facing camera. For connectivity it had all Bluetooth 4.0, USB port and HDMI port. It comes in both 16 GB and 32 GB model with no micro SD slot. It cost $399 for 16 GB and $499 for 32 GB. With Google high end 10 inch tablet Google has also launched its high end Smartphone in partnership with LG, Google Nexus 4. 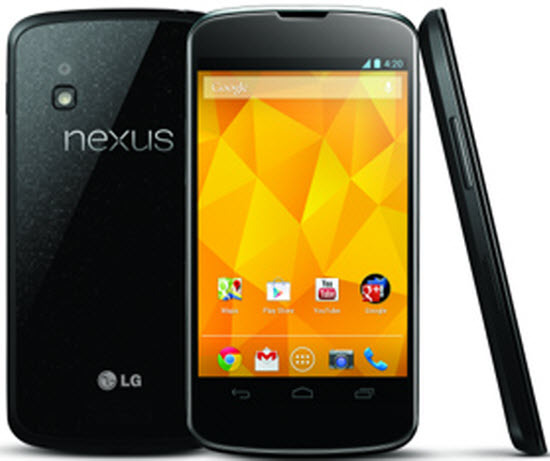 Same as nexus 10, Nexus 4 also has high end configuration and specifications. Google Nexus 4 has a screen size of 4.7 inch (1280*768 pixels) with full HD IPS display which is scratch proof as it is coated with Gorilla Glass 2. Nexus 7 has a quad core 1.5 GHz processor with an amazing RAM of 2 GB in a Smartphone. Same as Nexus 10 it runs on Android 4.2 Jelly Bean. Camera is very powerful of Google Nexus 4. It has 8 mega pixels sphere camera at the rear and 1.3 mega pixels front facing camera. It also does not support Micro SD card but comes with comes with both 8 GB and 16 GB of internal storage. 8 GB version cost $300 and 16 GB version cost $350 which is half the cost of iPhone 5 but with similar features. With the launch of Google Nexus 10 and Google Nexus 4, Google has upgraded its Nexus 7 with new and amazing features. Most importantly Nexus 7 will now work on 3G. Google has added on versions to this tablet Google Nexus 7. Earlier this tablet comes only in 8 GB for $199 but now it is also available in 16 GB and 32 GB model. All the models will now run on Android 4.2 Jelly Bean as its operating system. 16 GB model cost $249 with Wi-Fi and 32 GB cost $299. Every company is trying to capture the market with its new products. Google is trying to do the same with its ne range of products. Let’s see who will win the cut throat competition.